Welcome to Guelph’s home painting services, Our Professionals are here to help you with all your painting projects. Whether that be exterior painting, staining or interior painting of your living room, dining room, kitchen or bathroom. 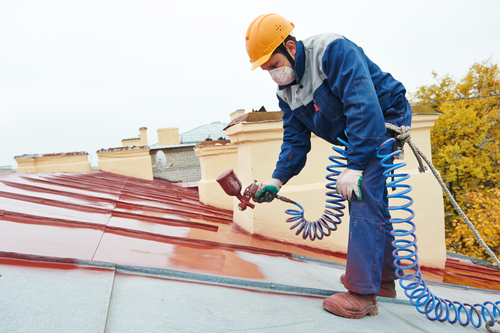 We strive to provide the highest quality workmanship on all your painting projects. Are you looking for a fresh new look on the interior or exterior of you home? We can help! 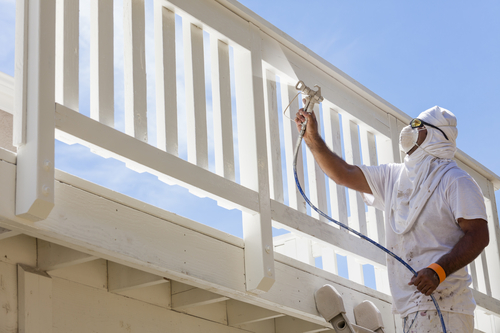 With years and years of experience dealing with many different painting projects from painting newly built homes to re-staining your old back deck. You’d be surprised at how amazing a fresh coat of paint can be on the eye’s. Did you know painting is one of the least expensive home improvements you can do to make your home look like new again. Whether you plan on selling your home, painting your brand-new home, or just get a new look on the interior or exterior of your home Guelph's painting contractor can help. 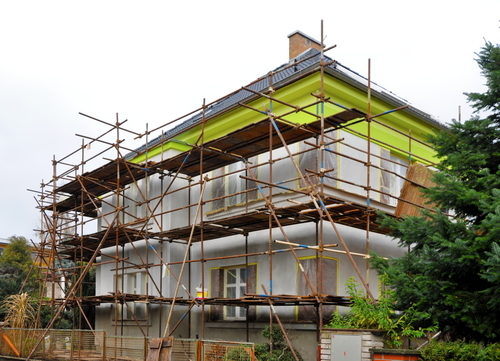 Your house is your biggest investment and are here to make it look the best we can with our professional painting services. Did you find your dream home and you’re super excited to move in but you need it to be a little more… you? Or maybe you’re looking to repaint a few rooms and get a fresh new look. If you have a special addition coming to the family and need a babies room painted or your brand new custom home we can help! Guelph house painters is equipped with all the tools and techniques to deliver you a high quality finish. 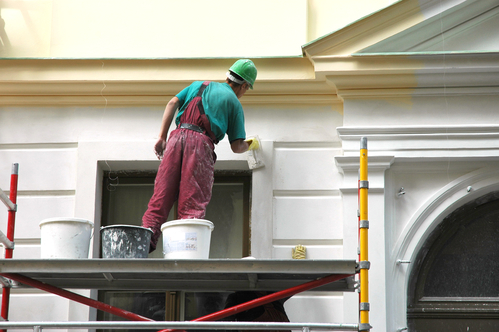 Our professional experienced painting crew works efficiently to deliver a high quality painting job with a finished product that will leave you in awe. We have been painting & repainting homes for years now and have a bit of a knack for what colors should go together or what finish would suite your project. We’d be happy to help you out with any color consulting to help you get the look you want. P.S. Pinterest and Houzz.com may have some great ideas for you (if you didn’t already know ;). Guelph’s residential painters uses the highest quality paint products from manufacturers like Sherwin Williams paints, Dulux paint company, Benjamin Moore. 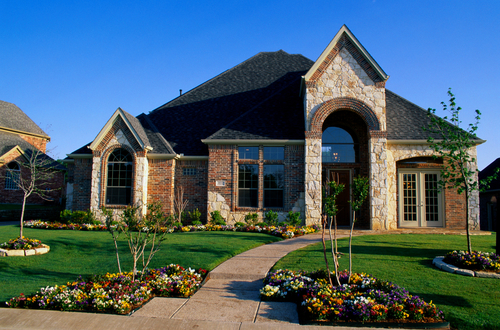 We use premium paints, primers, stains and finishing products to get the job done with high-lasting quality. Let’s say you have a slightly older home that has cracks in the plaster or drywall and you’re looking to spruce up the room, but you currently use this room daily. No worries! 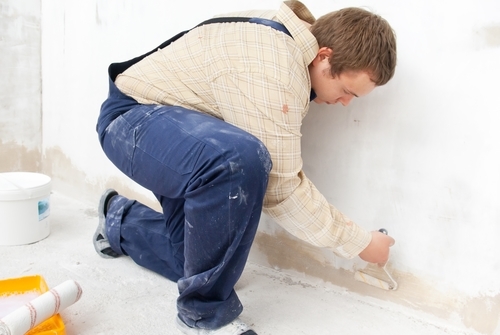 Our expert painters will repair the plaster or drywall and strip any loose paint or remove wallpaper if needed. Then we can prime and use a natural low VOC paint (a paint that releases virtually no fumes keeping the paint smell to a minimum). Our residential painting service can help. 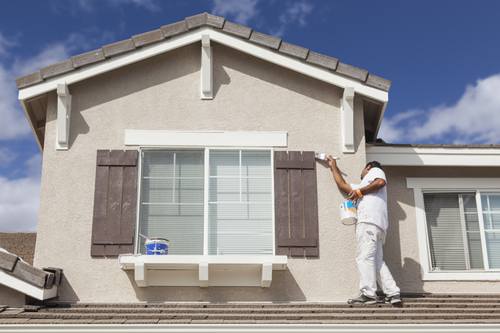 Exterior painting is the best bang for your buck when it comes to getting that fresh new look on the exterior of your home. Have the best looking home on the block with a new coat of paint or stain on your siding, eaves trough, windows, deck, chimney, railings or doors. But you don’t just want the best looking home, you want the paint project to last and that is where Guelph’s best painting company strives. Our in-depth process will give you a lasting paint job that not only looks good, but will hold off the extreme Ontario weather conditions we get in the Wellington County and Region of Waterloo. I can’t reveal it here but I assure you we go extra lengths to prep the project before getting started because that is what will make your project not only look good but also stand up against the elements. We can prep and paint any type of exterior surface including: brick chimney, fireplace, wood siding, aluminum siding, steel siding, cedar shake, board and batten siding, eaves trough, railings, soffit & fascia, stucco or any type of surface you may have. Your local home painting experts use the right products and process’s to get the job done right. ​Your deck isn’t the only one that’s peeling. The snow from the harsh winter months can do a number on your stained or painted deck. Guelph’s professional painters can provide the perfect solution to help your deck look great again. We can many options from sanding to pressure washing. If you have mold on your deck or fence you’d be surprised at what pressure washing can do to the look of your deck. And Guelph’s painting and staining company always uses the proper practices. For instance, you should always wait at least a week after pressure washing your fence or deck and it shouldn’t have saw rain for at least 3 days before re-staining or painting. If the wood that’s being re stained is wet there is a good chance the stain won’t absorb into it giving you less protection. Guelph’s best painting contractor can assist you in all your staining or painting projects whether it be your deck, fence, railings or shed. Contact your local painting company for a free no obligation estimate today. ​​It’s the hidden secret that virtually no one knows about, paint sheens! You can’t, I repeat you can NOT just go to your local paint store such as Rona Guelph, Canadian tire Guelph, Sherwin Williams Guelph, Behr Paint& Stains, Dulux Guelph, Heer’s Paint & Décor, Home Hardware Guelph and get your colour of choice, you must also know what kind of sheen you’d like with that. There are many choices to choose from such as: flat (matte), flat enamel, eggshell enamel, satin enamel, semi-gloss enamel, hi-gloss enamel. They all serve their own purpose in making your painting projects look as amazing as you planned. If you would like to know more about the best sheen to go along with those fabulous colours you chose then contact us, we’d be happy to help, you can also ask for Guelph’s best painter reviews. Are you having trouble finding out which colour will look best for you new painting project. Worry no more, just purchase a quart of paint and apply a 2’ x 2’ square in the room of your choice, this way you can see how well the colour goes up against your furniture and flooring. Give it a few days, you will be able to see how it looks in different shades of sunlight, we can also help you apply the paint, that’s why we’re Guelph’s top rated painters. Your local interior painting contractor and exterior painting service provides professional workmanship in the following areas: Wellington County, Region of Waterloo, Kitchener, Waterloo, Cambridge, Tri-cities area, St. Jacobs, Elora, Fergus, Drayton, Palmerston, Halton Hills, Erin, Aberfoyle, Acton, Rockwood, Belwood, Elmira, Grand Valley, Arthur, Eramosa. We look forward to having you as a new client, our business is built off long lasting relationships.